The hardest decision in packing for my diving vacation was which wines to bring. I wanted delicious wines, of course. But I also wanted wines that were symbolic and appropriate. I wasn't trying to bring wines just to save money: I wanted to make a statement. Baggage on French Polynesia domestic flights is limited by weight, and we decided we had room for about 2 liters -- not coincidentally, the legal limit for one person. French Polynesia is part of France, sort of. The official language is French; people eat baguettes. Most imported food products are French. Wine, with the exception of Vin de Tahiti, is almost exclusively French. On my previous visit, some French divemasters expressed astonishment that anyone outside France could try to make a living writing about wine. "I heard that other countries make wine, but ..." one said. I wanted to wave the vinous Stars and Stripes. But how? * White wine. It's hot in French Polynesia and we ate fish every day. * Couldn't be too old, too expensive, or too irreplaceable as it could get cooked in transit or in our rooms if we had no refrigerator. * Something representative of the USA that I couldn't get from a French winery. Instead of bringing Chardonnay or Sauvignon Blanc, I should buy Burgundy or a Loire white on site. * Something I could proudly explain, and offer a sample of, to any French hotelier who asked. A wine to make me proud. As I would celebrate my birthday there, I brought one bottle of Schramsberg Reserve '03. Sure, I could have bought Champagne locally, but probably not aged tete-de-cuvee Champagne. And as the day coincided with the Orioles' first playoff win in 15 years, I was happy to open it to toast them and myself. I thought about aperitifs and digestifs and the climate and brought a 500 ml bottle of Madeira, in this case a Blandy's 5-year-old. This was a great call; Madeira is indestructible, refreshing, delicious and versatile. We had a glass of it while watching sunset on the pier every night until it ran out. This is a great wine, one of the best California white wines I've tasted this year. Swiss-born winemaker Markus Niggli sent me two sample bottles a few months ago. I tasted one, was wowed by it, planned to blog about it, and just moved on to other things. I still had the second bottle. * It's unique to California. Niggli makes it from three German grape varieties grown in Lodi (Kerner, Gewurztraminer and Rieslaner), and partially barrel ferments it, a technique he saw in his native Switzerland on one other wine. But he has further innovated by starting the fermentation in stainless steel and moving it to barrels to minimize the oak character. * It's a wine of terroir. All the grapes come from the Koth family's Mokelumne Glen Vineyards just east of Lodi. In fact, Lodi is the only place Kerner is grown in California: there were just 3.2 tons harvested in 2011, and the Koths grew most of it. * It's lively and balanced, with just 12.8% alcohol. With my body full of nitrogen after diving, a high-alcohol wine might put me to sleep, possibly even for good. I asked Niggli how he kept the alcohol so low and he said simply, "You pick early." * It's affordable, at $22. * It's delicious. And complex. And constantly interesting. It has the lively fruit you expect from California -- mostly white stone fruit in this case -- with an expressive, floral nose thanks to the Gewurz and a strong spine of minerality. Every sip was worth savoring. And it was even more delicious the second day. Niggli says the Kerner is the source of the minerality, as well as the layered mouthfeel. "You also get the upfront freshness from the Kerner," he says. "But it's all about the mouthfeel." Can we please get some more Kerner planted in this state? * I wish I had known this story when drinking it: catfish swam in the vineyard in July, when authorities released excess snowmelt runoff from reservoirs and that flooded the Mokelumne River. I asked how that might have affected the wine, and Niggli says it might have helped by reducing crop; he's a stickler for a small crop. I didn't taste any catfish. But it would be great with catfish. We had it with poisson cru in coconut milk and fresh tuna tartare and grilled parrot fish and it was outstanding. But I wouldn't hesitate to drink it with pork or chicken or a green salad. 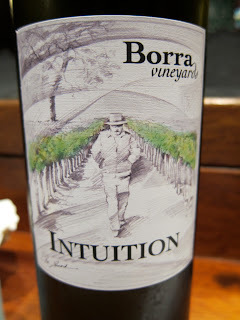 So this was the wine flag I chose to wave: Borra Vineyards Intuition. Stars and Stripes and Lodi's finest. USA! Only 142 cases were produced, but you can still buy it directly from the winery. Glad you had a great time, Blake! And thanks for the support for Lodi. Nice choice of wines. Cheers on making my day! Great post Blake. I enjoyed visiting the Borra Vineyards website too. Best wishes!